As part of our Summer Series of events at our café, TALKSTORY TUESDAYS are bimonthly conversations where leaders in art, culture, and industry share their perspectives about the unique culture of Hawai`i Island. "Talkstory" is a term used to describe the common laid-back conversation that happens between people in the islands. These events are free and open to the public. Aunty Leialoha Kaleimamahu brings us a Hawaiian Perspective of Pele, Mo'olelo through chant. Aunty Lei is from Kaimu and Mokuhulu and she is a Puna Cultural Practitioner, Professor, and Researcher. 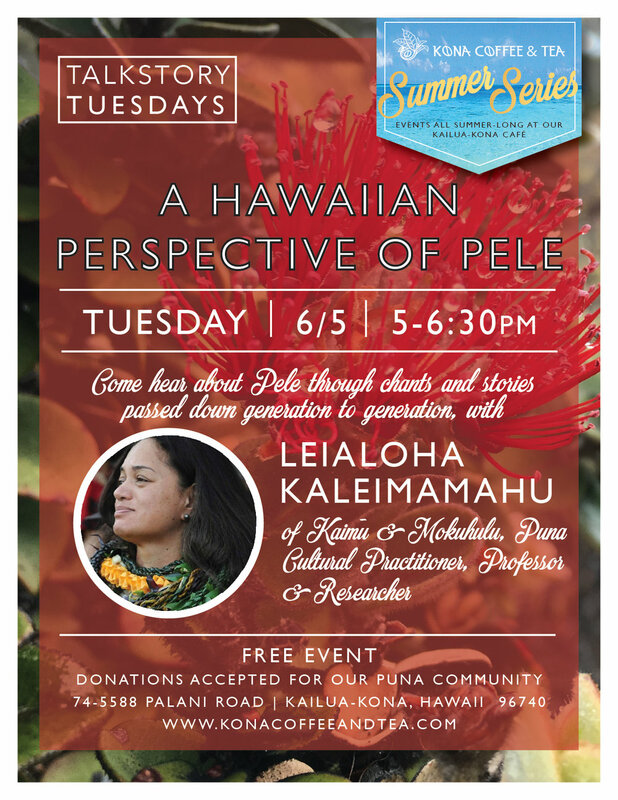 Come hear about the legends of Pele, With Pele, the Hawaiian goddess of fire, through chants and stories that have been passed down generation to generation. Through media; social, tv, radio, impromptu things that people have been doing... I had a sense of high anxiety, anger, sadness, blame, shame and all that. Going out for just a brief moment to be with other people from around the world has reconfirmed what I’ve always known..... Hawaii is unique, aloha is real and Ohana is always there.. I know that losing our land and house and belongings are so hard and for some it may take a lifetime to rebuild, it’s gonna be ok, cause we are more than our belongings. This is not an informational presentation on the lava flow and what is happening now but it is to offer a Hawaiian perspective on Pele as we have so many thoughts of that , and it causes much confusion and used as a way of blame, shame and misunderstanding. In spite of the hard reality, we are in a time that we would have never thought would happen in our lifetime. Even if we knew it could happen. It is an auspicious time and we can be writing our own stories, Mele, chants. I know I am. So, If you want to learn and have a open heart to hear the stories then I invite you to come and let’s learn together. This ‘Ike can be soothing to the soul and spirit.....and maybe just maybe start us on the path to the other side of what is happening now.